Neural therapy is an injection therapy that focuses on the relief of chronic pain and long-term illness. These symptoms can be stopped by injecting local anesthetics into scars, acupuncture points, and points along peripheral nerves. Neural therapy is commonly used in Europe, particularly Germany, to treat a variety of health and painful conditions focusing on the health of the autonomic nervous system. As long ago as 1925 a great French surgeon found that a correctly sited injection of a local anesthetic was often more effective than major surgery and could often take the place of surgery. For years, more than 50% of all established practitioners in West Germany have been using neural therapy successfully in their day-to-day practice for both diagnostic and therapeutic purposes. The autonomic nervous system controls and regulates or co-regulates most metabolic, immunological, healing, digestive, hormonal and many other body functions. 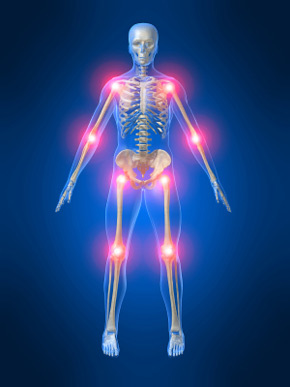 The autonomic nervous system can be affected by scars, toxicity and unhealed emotional trauma. The benefits of neural therapy are as varied as the different conditions the patient presents to the doctor performing neural therapy. 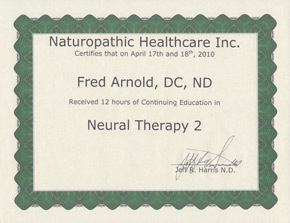 Neural therapy is a healing technique that will often help when all other methods have failed. Often healing occurs so rapidly and unexpectedly that it is referred to as a “lighting reaction”. Neural therapy is a safe, effective technique that can be applied to common problems in all areas of medicine: general practice, ENT, ophthalmology, gynecology, internal medicine, pain management, psychiatry and all other specialties and subspecialties. Neural therapy should always be considered in chronic painful conditions and any long-term illnesses, particularly when surgery has been recommended. Because of its effectiveness, neural therapy has be referred to as the “surgeon’s conservative knife” taking the place of surgery. 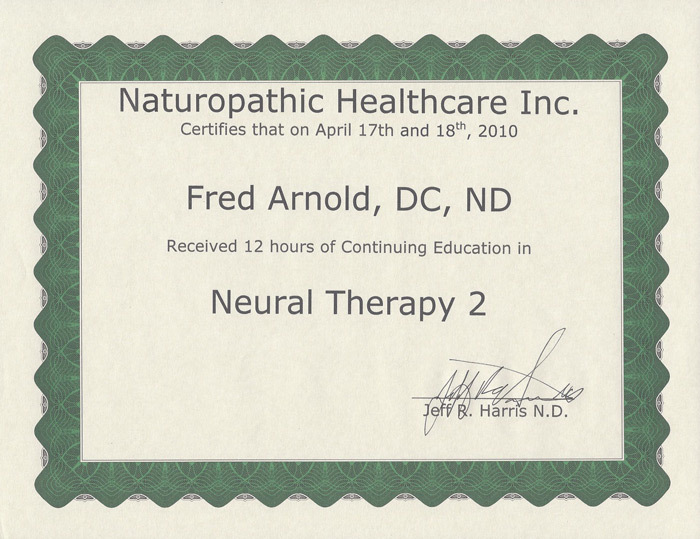 Dr. Fred Arnold has practiced Neural Therapy since 2005 and he has received training in Neural Therapy from Dr. Thomas Rau M.D. ; Dr. Detrich Klinghart, M.D., PhD; Dr. Gerald Harris, D.O. ; Dr. Jeff Harris, N.D.; and Dr. Kent Pomeroy, M.D..